Altered Instinct: PODCAST REVIEW: Who was Lily The Pink? PODCAST REVIEW: Who was Lily The Pink? So went the lyrics to one of the songs we used to sing in primary school, but who was Lily the Pink? That was Lydia Pinkham – a woman who was a pioneer in the worlds of business and medical concoctions. She's also the subject of the latest podcast by The History Chicks, who delve into the life and times of both Mrs Pinkham and the world around her. 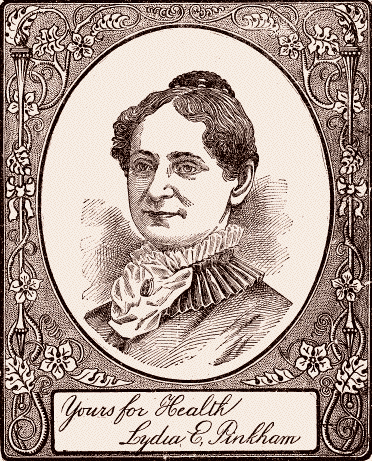 Mrs Pinkham came to prominence in the 1800s thanks to her remedy for female complaints, as it was described. She used to make it and give it away to friends and neighbours, but when her husband's businesses faltered in tough economic times, up stepped Mrs Pinkham to become an economic powerhouse. With her face on the product, her Vegetable Compound became a roaring success. More than that, she also became a figurehead for women, and the product was driven by letters from those using the product, creating a possibility of women's voices being heard at a time when it was frowned upon for women even to walk in the company of a man without others present. It's a cracking little podcast, full of little snippets of detail – such as the Pinkhams receiving an offer to buy them out only six months after putting Mrs Pinkham's face on the product. That offer, in today's money, was worth more than $2m – but the Pinkhams said no. Mrs Pinkham was also a supporter of the anti-slavery movement and of feminism. It's a delightful listen, well worth the time, and sparklingly delivered by the hosts. The History Chicks seek to reveal more about women throughout history – very well worth a listen. The recent UK election is a goldmine for analysts of politics. There's the discussions about coalitions, the questions about how representative the Parliament is of the votes cast, the rise of nationalist politics, the punishment handed out to the Liberal Democrats for going back on promises – all kinds of things to study. My History Can Beat Up Your Politics sets the context, however, by looking back at previous elections and how coalitions rose and fell over the years, and the effects that would have on the country. It's an intriguing listen, particularly as the host is observing from outside, his US drawl picking over the details of history one by one. Having a single host does wear from time to time, it would be nice for the podcast to be broken up a little more so you don't drift at any stage, but he's a good host with an engaging voice and mind. It's a worthy listen – recorded just before the election took place – as much for the political theory being discussed as the actual specifics. There are certainly lessons to be learned for politicians sharing the Westminster dynamic. Perhaps the thing that stands out most to me from it is the question of representation. The last election saw perhaps some of the most extreme differences in terms of numbers of voters for minority parties versus the number of seats they actually attained – UKIP and the Greens suffering the most with only one seat each in Parliament. That's the kind of analysis that prompts questions about fairness and change. Less successful in its illuminations is the Revolutions podcast discussing Citizen Genet. Citizen Genet was Edmond Charles Genet. Rather than being called Monsieur, he preferred to be referred to as Citizen, a square peg in the round hole of society. It seems to take an age to get to the meat of the podcast, past lots of promotion and adverts and discussion of how they decided to make this episode. Less of that, please, and just get on with it. Because there's a cracking story to be told about Citizen Genet, who became French minister to the United States from 1793 to 1794. Fluent in six languages, it turned out – as the podcast notes – that one of those languages was not the language of diplomacy, with his activities prompting a diplomatic crisis between France and the US. This followed his being declared persona non grata in Russia in 1792, so perhaps there should have been a hint of what was to come. The headstrong Genet ran into problems as he started to negotiate trade treaties with the American Revolutionaries and began to hand out privateer contracts for the hunting down of British ships by vessels based out of US ports. However, this made him run foul of a chap by the name of George Washington... the president of the fledgling US, which had a policy of neutrality. Warned and warned again, Genet carried on encouraging privateers leading to the US seeking his recall. And yet, in the end, the US allowed Genet to stay in the country until his death – when it turned out that his recall would lead to his likely execution after a power shift. It's a fascinating story, but the podcast doesn't really give it much zing. It tends to drift along. Again, a single voice doesn't help so it comes over as a history lecture rather than a discussion. This serves as a set-up for a lengthy examination of George Washington's history – and it's undeniable that the host knows his stuff. One to focus on, not have on in the background.